Sometimes things don't work out the way you plan, but learning from failures can be valuable. I'm referring to the restrictive capacitive touch screen guide I designed a couple posts ago. It didn't work, but the interesting thing is that it failed in a way I didn't expect. First, a quick refresher for anyone unfamiliar with what I was trying to do. I use a mobile computer with a touch screen at work and it's remarkably difficult to use. A lot of my tasks would go quicker if I could type without looking at the screen, but that's impossible with a touch screen. This was an attempt to add some tactile feedback to the process. I'm going to be a tease and leave why it didn't work, or at least my assessment of the failure until the end of this post :-) First let's look at 3D print itself. As you can see from the image above, the print came out a little rough. I had a friend print it for me on his printer, and as this was my first print, I don't have a lot of experience with the finer details of the process. It was a new roll and the machine was still being dialled in and after some reading it looks like the feed rate of the PLA filament was a little high.. The inner layers that were something like 70% infill worked quite well, it was just the solid surface layers that were rough. I think this means that on the inner layers the excess filament had somewhere to go, whereas the surface layers were doing something like 105% infill for example. No biggie, this can be cleaned up. I made the holes a little smaller than they needed to be. They can be expanded to the right size later on. The semicircle guides that hold the rubber bands in place worked out well. They could've been maybe 0.5 mm higher and 0.5 mm further apart. The bottom of the part came up well, but was a bit hard to remove from the heated build plate. After filing and sanding the part, the holes were expanded to a size to allow a thumb pressing on them to touch a screen beneath. In the image above you can see that the holes are almost as big as they can get. Any larger and they would start to merge. The holes were tapered to leave a decent amount of plastic at the bottom, making the part rigid. This is acceptable as the hole doesn't need to be as large at the bottom. When tested, the device fit the screen perfectly and the rubber band held it tin place as it was designed to, but the screen wouldn't register button presses. This is in contrast to tests performed on my tablet where the screen was registering presses in random locations. So what went wrong? Relative permittivity, I think. Touch screens are designed to detect presses from a watery finger surrounded by air. It's hard to find data, but the relative permittivity of PLA plastic is around two while air is one. It may not sound like much, but the screens are calibrated to work in air, not under a large piece of PLA plastic. A structure like the one I designed changes the electric fields the capacitive screen expects to see and basically confuses it. It's an interesting failure mode. Now let's think of ways around that. Reduce the amount of plastic to minimise the effect it has on the screen. This can be done by changing thickness, infill or adding extra holes. All of these option make the part weaker though. What about a plastic that has a low relative permittivity? Unfortunately it doesn't get too much better than this. You could add small bumps to move it away from the screen and make it thinner. This then makes it harder to manufacture. I think there's a possibility of making a working version. You could iterate on the geometry to until a solution was found but as this was for a bit of fun I'm not going to try. It's also hard to compensate for the different finger and thumb sizes of people. Besides, the powers that be have acknowledged that the on screen keyboard is a hot mess and have redesigned it. Unsurpisisngly it's still terrible, and it doesn't solve the problem of tactile feedback. If I were to pursue this further my next step would be an electronic solution. (What a surprise I hear you say. When all you have is a hammer, everything looks like a nail) Turns out that the scanner has a micro-USB port that you could plug a keyboard into. 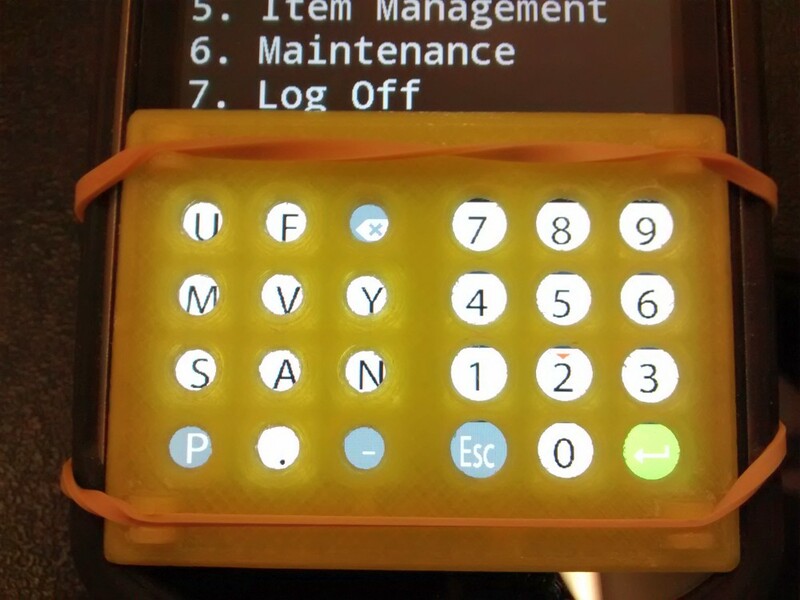 It's also possible to plug in something like a custom PCB with an array of rubber membrane switches on it. I'd also add some audio feedback so I know a button has been pressed. You may think that I'm obsessing about this, but this has turned what used to be a 5 second job into a 10-15 second job. Then consider that this task is done around 50-100 times a day, by 3 or 4 staff in 700+ stores. It's worth hiring a designer to iron out the interface and make the process simpler. So in summary it was a successful failure. The form factor and my physical design worked as I had planned but the overall concept was flawed. Anyway, I'm now thinking about more things I can print.